I had no idea where I would go photo hunting today, since time was limited. I had to go to Templeton, so I decided to explore a road to its very end, just to see where it went. I almost couldn't get on it because the road entrance was blocked by a huge tow truck trying to get a stalled motorist back on the road. They recommended I just go over the low curb to get around them. So reluctantly, I did. 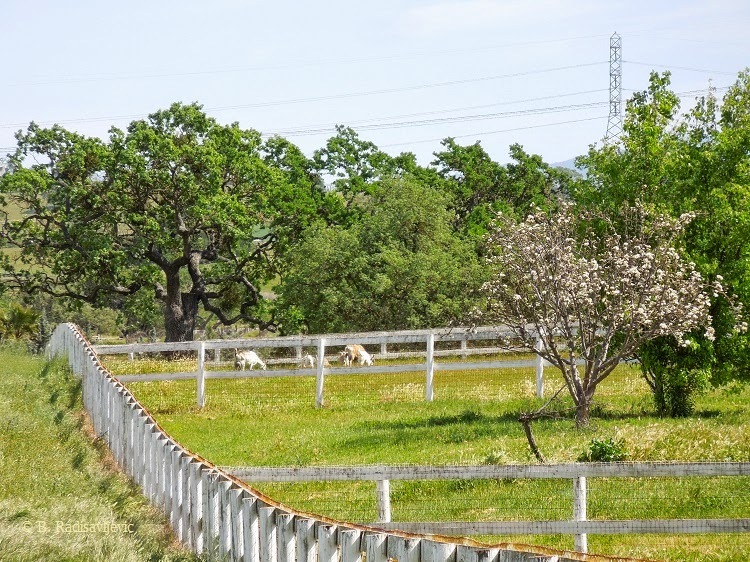 The road I had selected was Twelve Oaks Drive that goes past the Doce Robles winery, vineyards, and tasting room. I had often walked part of that road, but I never had seen where it ended. It actually wasn't as long as I thought it might be. 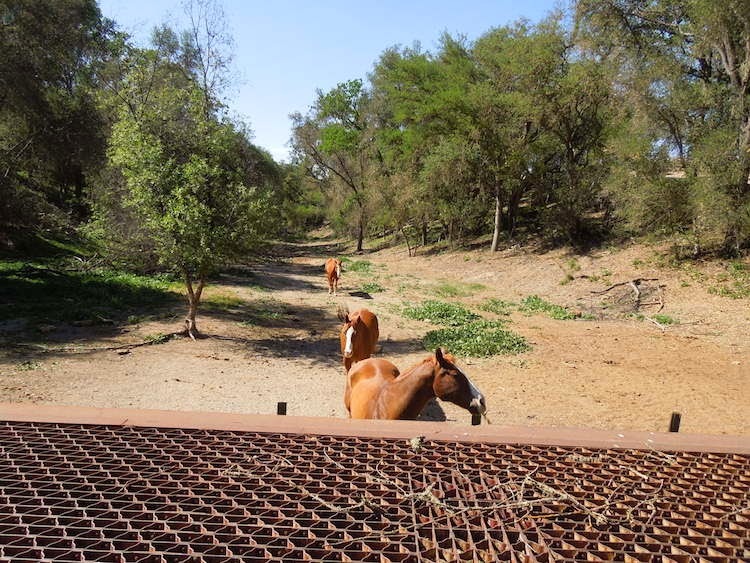 It's curvy and goes through a grove of oaks and then crosses over a dry creek on a sort of bridge. As I was crossing the bridge, I look over the edge and saw this. You can click on the picture to make it bigger. I zoomed in to get a closer view. I could tell it was a beautiful horse. I was parked on the bridge and had gotten out of my car to snap the pictures. That's when I discovered this lovely horse had friends. 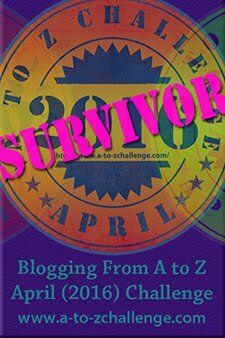 I had gotten back in the car, and when I looked out the window, I saw the group moving toward the bridge and my car. They seemed curious. I would have loved to have stayed and watched them longer, but I was parked right on the bridge and there was nowhere to park on the side of the road. The road ended on private property almost as soon as I crossed the creek. I reluctantly headed for home. Fortunately the road was no longer blocked. Have you had any surprises today? 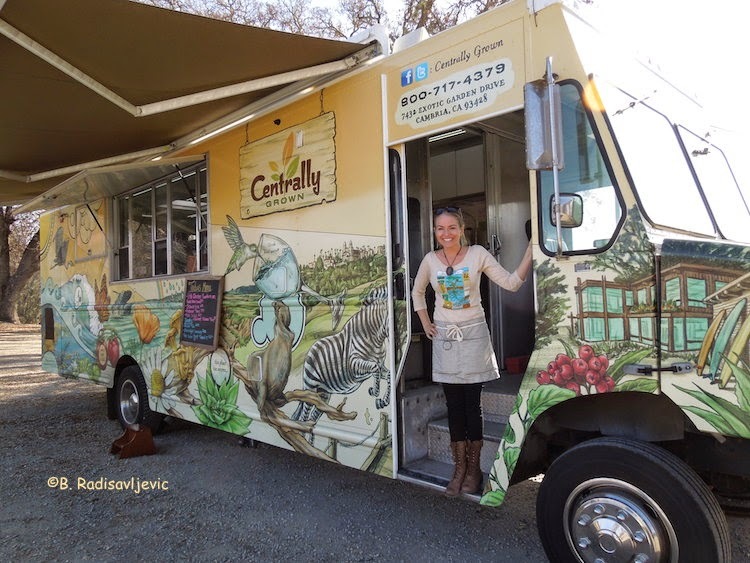 I first saw this truck one day when my husband and I were on our way to take one of our favorite walks on Oak View Road. 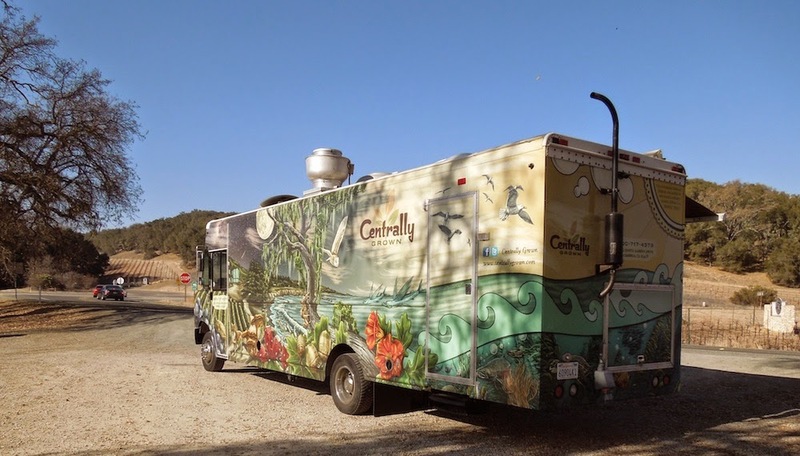 We always park in the lot for the Donati Family tasting room, and on this particular day, we couldn't help but notice this truck. It was encouraging people to buy its wares as they entered and left the tasting room, but we had already eaten, so we didn't sample the menu. We hadn't brought any money anyway that day since we rarely take it with us on hikes. Just so none of the art work is lost to you, here is the opposite view of the truck. Creative, don't you think? It certainly makes one want to try their food. I live next door to two wineries. I share a back fence with the Croad vineyards and if you are driving by on Highway 46 West, Zin Alley is my next door neighbor. I visit both neighbors occasionally. 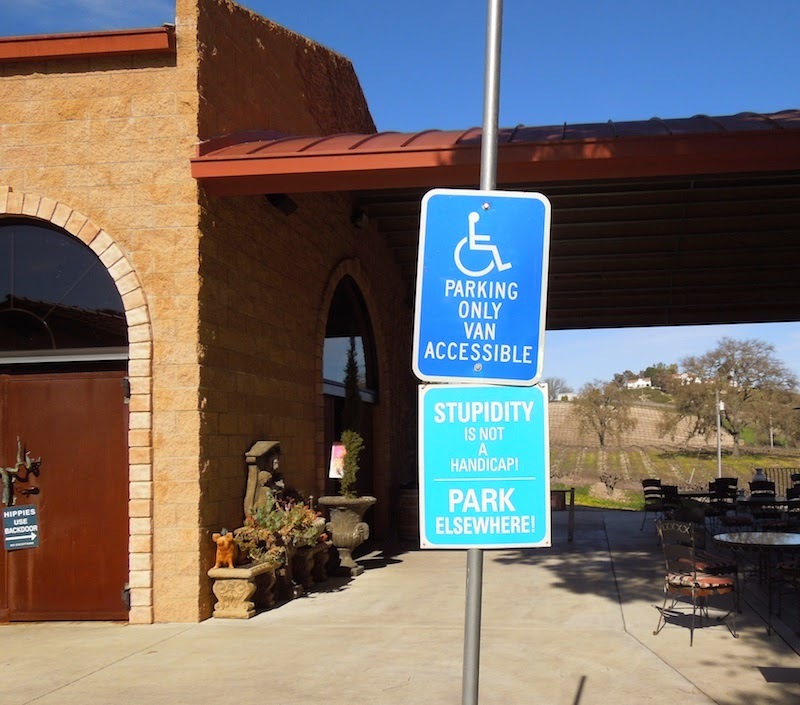 Every time I visit Zin Alley, I laugh at their signs around the exterior of the tasting room. If you click on the photo to enlarge it, you may be able to make out the words on the sign to the extreme left on the door. It says "Hippies use backdoor." A sign out of sight on the patio railing says "If you're smoking, you'd better be on fire. " But I find this sign in the upper parking area the funniest. Nothing like letting violators know what you think of them. Would You Like a Room With An Oak View? 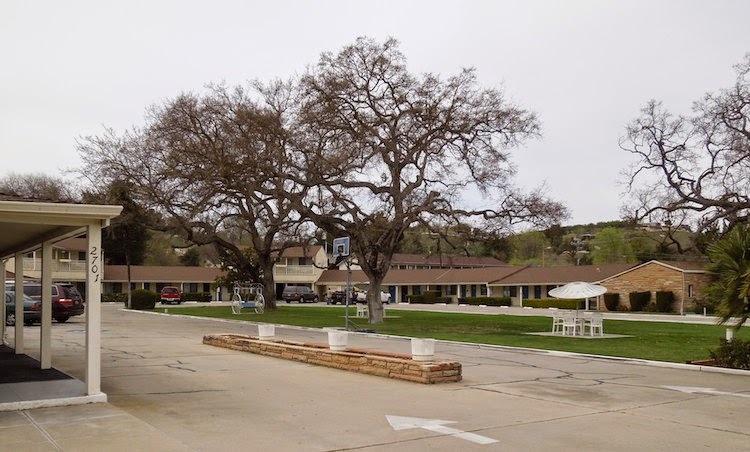 I suppose that would depend upon a number of factors At the Paso Robles Travelodge, just about every room has a view of these oaks in the center lawn. Anyone staying here will see plenty of other giant oak trees downtown as they make their way to wherever else they plan to go. But one could just grab some coffee and sit out near the oaks and get ready for the day ahead. 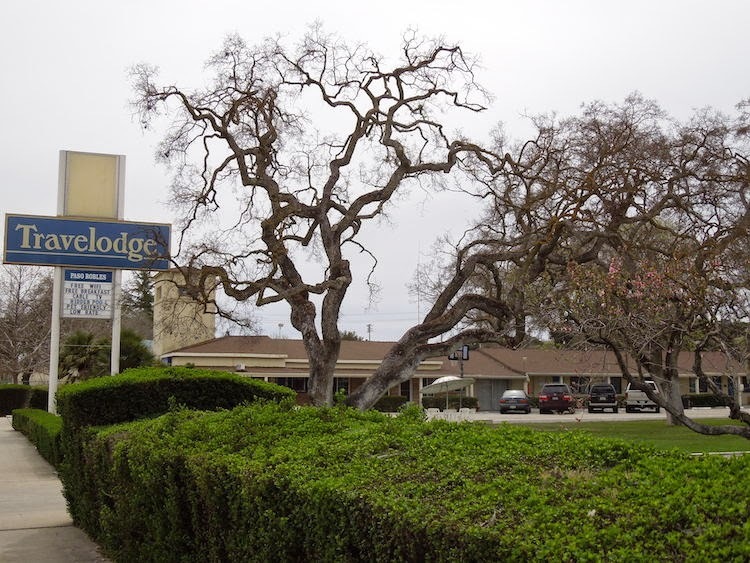 From what I've read in the Yelp reviews, the oaks are about the best thing about this motel, and it's better to see it from the outside than the inside. I've never been inside, since I live here, so I don't speak from experience. I just read Yelp's 2014 reviews. I suggest you do, too, before you make reservations. Meanwhile, you can enjoy the oaks just by walking by. Here are two more views. 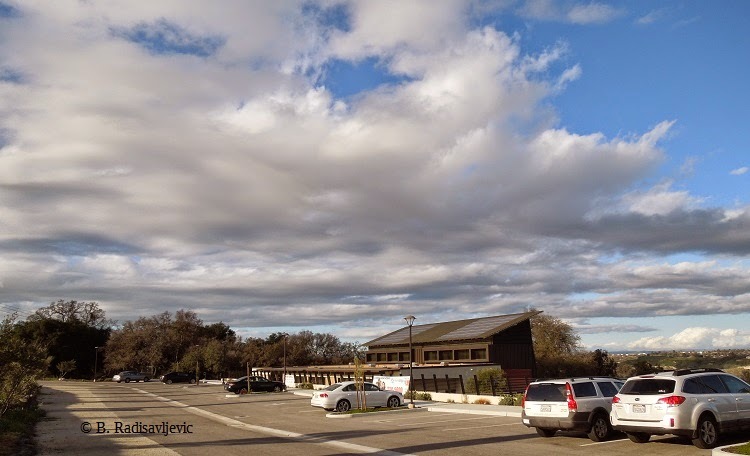 Paso Robles does have some excellent hotels and motels if you want to stay here while visiting Wine Country or one of our many festivals. But since conditions can change for better or worse any time ownership changes, I suggest you always read the reviews before booking. Yelp is a good place to start. 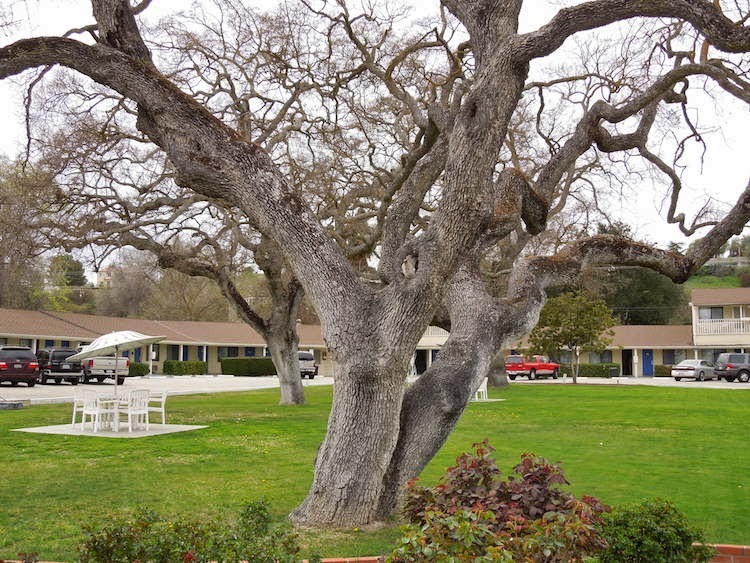 There's more than one place to stay in Paso Robles that has oak trees. If you listen to our radio and television stations you will hear a constant stream of commercials for solar power companies. If you look around town, you will see many businesses and homes have used their services. This first photo was taken in my walk through the Spanish Camp area this week. This second photo was taken of a medical office building on South Vine Street. The solar panels are on the roof of the building. If you click the photo it will expand so you can see the details better. I have seen solar power even in areas that were mostly forest, with only a few places the sun can reach. This last photo was taken in West Templeton off York Mountain Road. Most of that area is oak forest, and in places it is so thick with trees you can hardly see the light coming through. 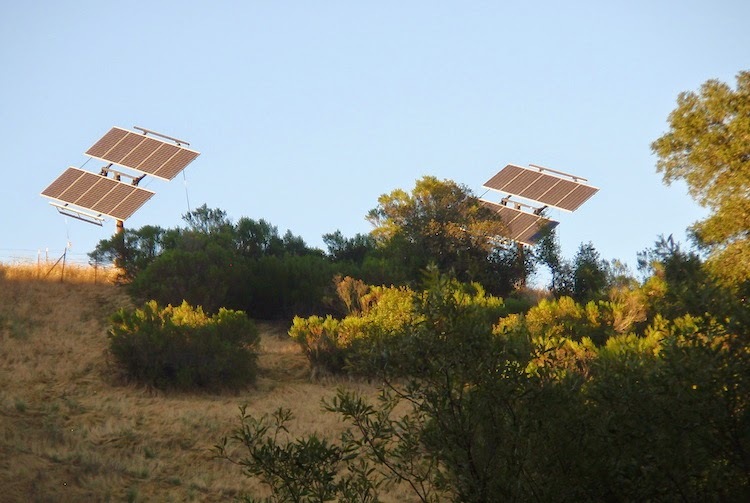 These solar panels are at the top of a hill. I took the picture from a hill on the opposite side looking towards it across a valley where there were homes. 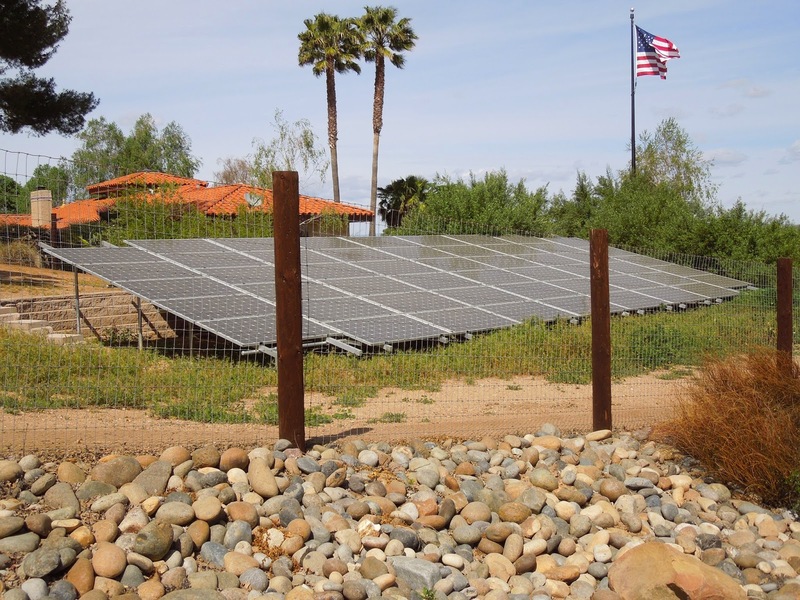 Are people using solar power in your community? Do you see it most often on roofs, on the ground, or in some other place? Larry Moore Park is a wonderful place to see a variety of trees in all states of growth and damage. I personally think the damaged ones are more interesting. Their suffering at the hands of wind, storm, and lightening have given them character that distinguishes them from the other trees in the park. 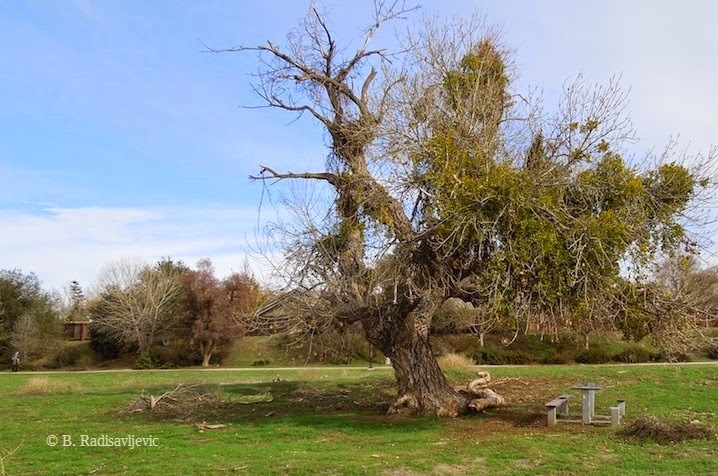 Often the trees are just skeletons and the only green thing about them is the mistletoe that feeds on them. Such is the tree in the photo here, which was taken in winter about four years ago. Except for all that mistletoe, it was still pretty much intact. Above is that same tree on March 4 last year, from the other side. You can see its broken branch, much of it still on the ground. It gets worse and worse every year. No one seems to care. The trees closer to the river are just left to disintegrate when they fall, but they are a bit better at hauling off parts of this tree a few months after the branches break off. Maybe that's because it's in the middle of the park near the trail. Even the vandalized picnic bench has not been fixed in over a year. 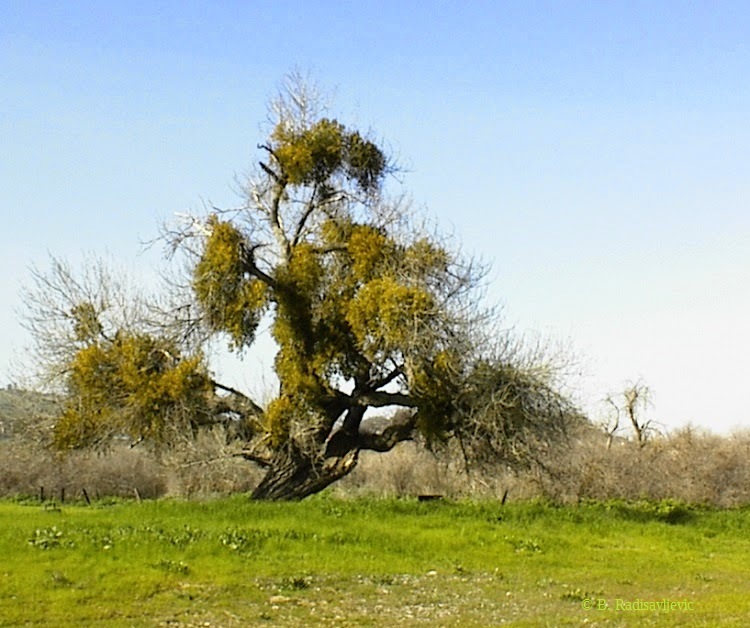 Today I shot this picture of a cottonwood tree near the other end of the park. It's actually not in the park itself, but on private property next to the park on the cul-de-sac. It is beginning to leaf out with new growth, but you can see it's also been reshaped a bit by nature. It is very close to the south entrance of the park at the end of Riverbank. Although the Spanish Camp area is only five minutes from where I live, I've never explored it before. I had heard there were some very large homes there on acreage, but until today I never saw them. I found the development quite by accident. I was coming home from physical therapy and decided to stop somewhere for my photo walk on the way home. 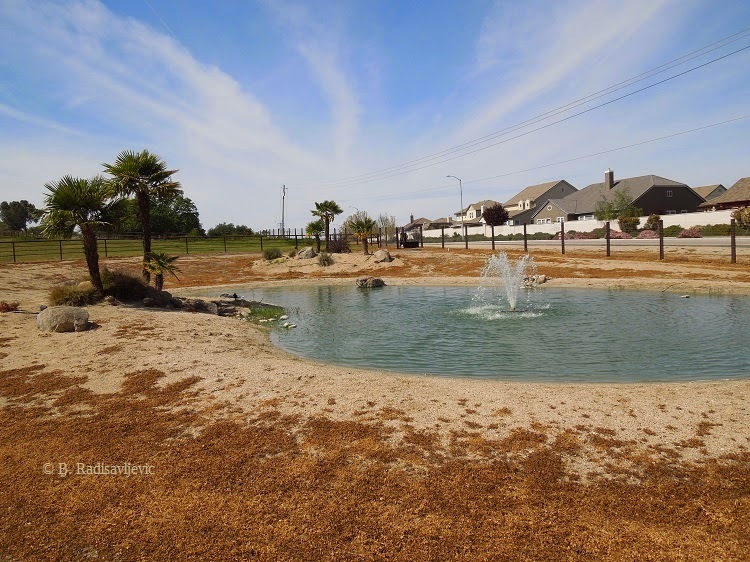 Instead of turning toward home, I just kept going south on Creston road until I saw what appeared to be part of a park -- the oasis you see in the photo above. It was on a corner, so I turned right and parked. Then I discovered this was in the yard of a private home. Each home had lots of land, and mature oak trees were scattered everywhere. I decided to walk up the hill in front of me, and on the way I noticed some goats at the very back of this lot. 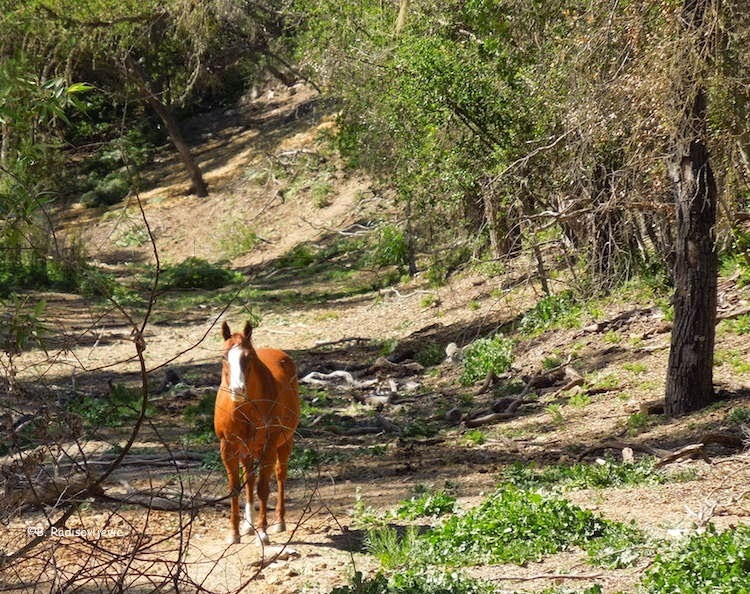 I had to catch them with my zoom lens, since they were far from the road. You can see the large oak right behind them. Do You See the Goats Between the Fences? I could see the crest of the hill only a couple of blocks away (if there had been blocks) so I decided to check out the view. Once at the top I could see a long way to the west and south. This is the shot I will share with you. What appear to be large flat stones as you look down the hill are really rooftops of other homes. This experience and the discovery of the Snead/Rambouillet Trail last week shows me that even when you live in an area a long time there are still discoveries to be made and much left to explore that you haven't seen. Have you come across any surprises in your own town lately? I previously walked this trail on March 18, but at that time I didn't know its name. 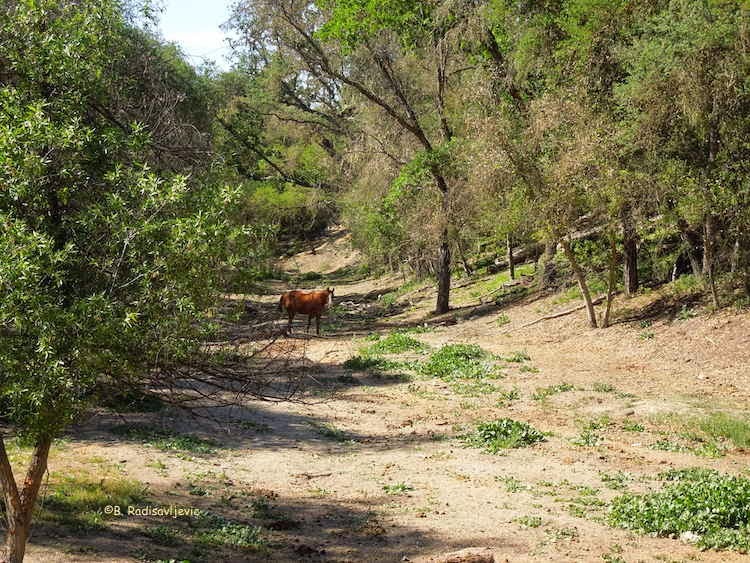 Evidently the official trail entrances are on Snead and Rambouillet, but I entered on Oxen near Brahma. 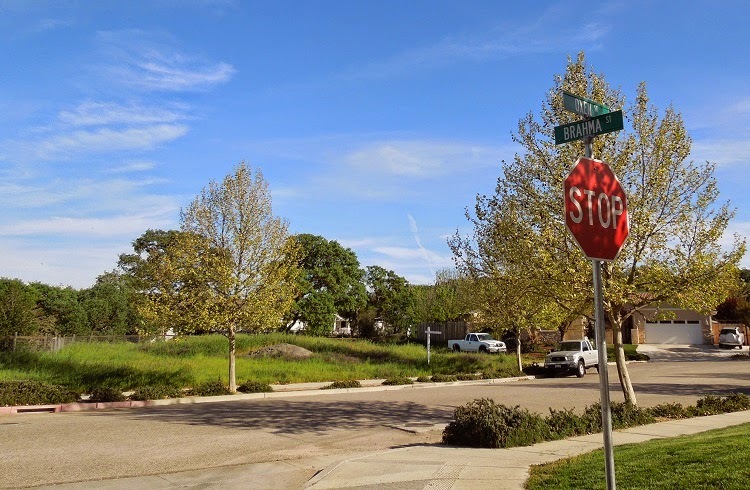 If you walk across the street from the sign toward the tree on the other side and then turn left on the sidewalk, you will almost immediately see the entrance to the trail on the right. I showed you the entrance in Surprised by a Hidden Trail on March 19. You see stairs leading from the sidewalk down to the trail. Last week it was dusk when I walked and I didn't have much time to explore. Today I walked in late afternoon while the sun was bright. As one walks down the steps into the forested open space, the first thing one notices at this time of year is the display of colorful wildflowers on either side of the stairs. I wasn't the only once to notice all those flowers. You could hear them almost before you could see them because the bees were very busy gathering pollen. 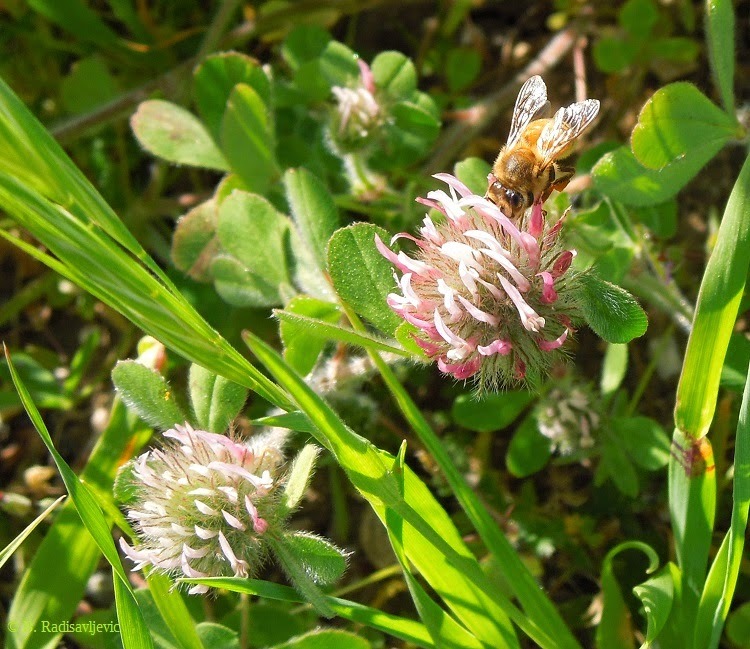 I caught this one on a clover blossom. 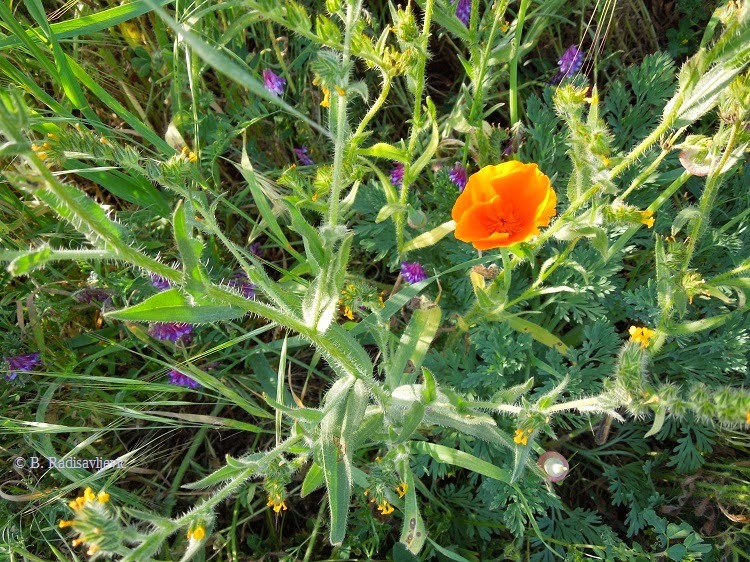 They were also doing the rounds of the vetch, but I didn't see many on the lupines and poppies, which were also abundant. The birds were also quite active. I could hear the woodpeckers in the trees, but I couldn't see any. 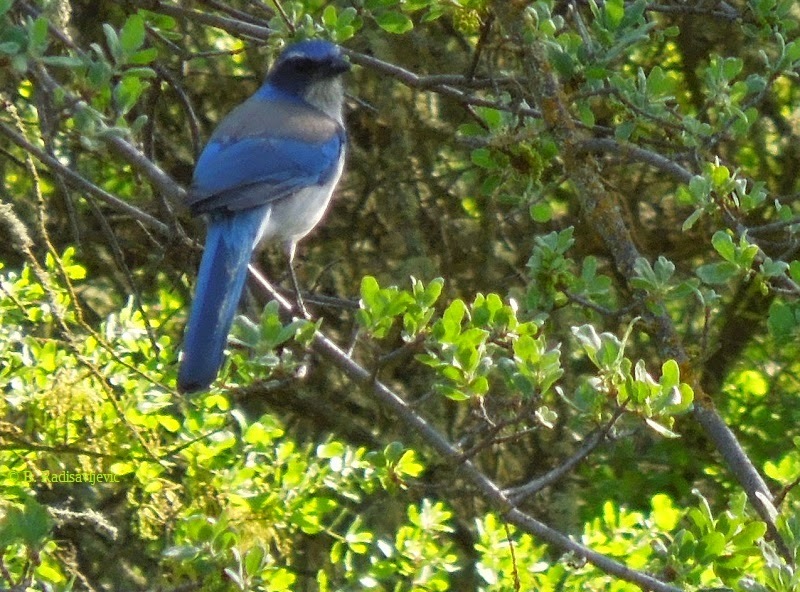 I did see lots of scrub jays like this one. They didn't seem eager to be captured by my camera, but I finally found one who decided to show off a bit instead of playing hide and seek in the branches. As I walked, I couldn't help but regret the suburb of Los Angeles I grew up in didn't have any wild places where kids could walk to a place nearby to explore nature. We had a park with a playground, a tennis court, a cement slab where we could skate, some ball fields, and some trees. There were no "wild" areas to explore. There were no creeks or ponds where one could see ducks and catch tadpoles. The children lucky enough to live in the neighborhoods around these trails have all of that. 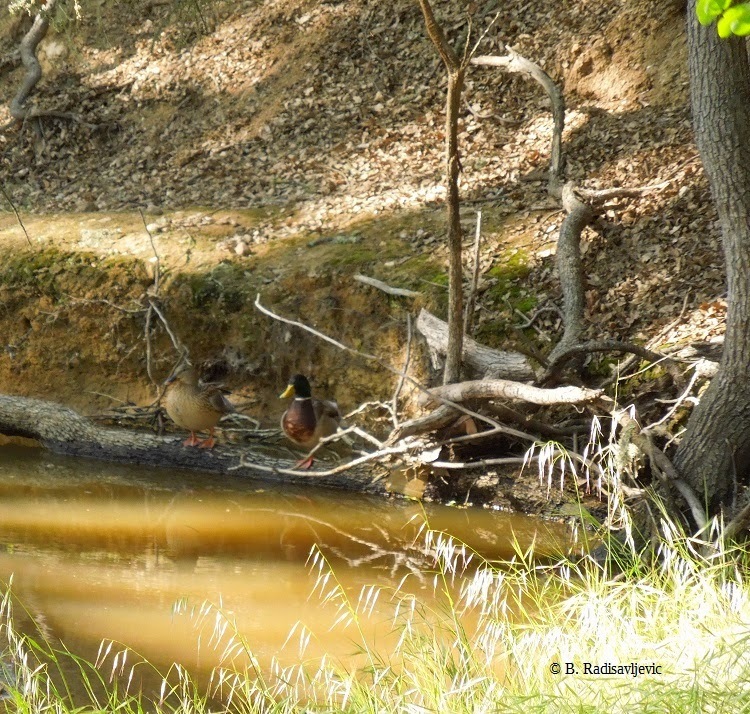 Here are a couple of ducks that were resting in the shadows beside the creek. I also saw tiny tadpoles in another park of the creek, but they were too small to photograph. 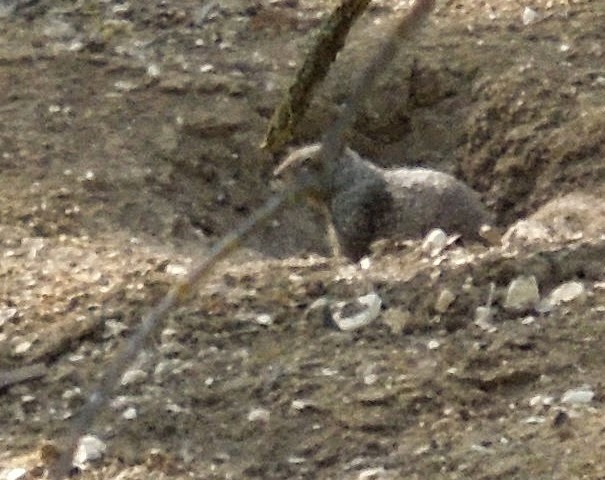 The ground squirrels I saw wouldn't pose for me, either, but I saw them. They would dive into a nearby hole before I could even see them clearly. Nevertheless I did my best to catch them on camera, and when I got home I found there was one who did not manage to escape my zoom lens. It's not a very clear shot, but it proves I saw him. If you'd like to encourage your children to explore nature, one of these books might be a good place to get some inspiration. Do you have any wild places children near you can explore within walking distance of their homes? What sort of wildlife do you see most where you live? I'm taking it easy today, so this post will be short. 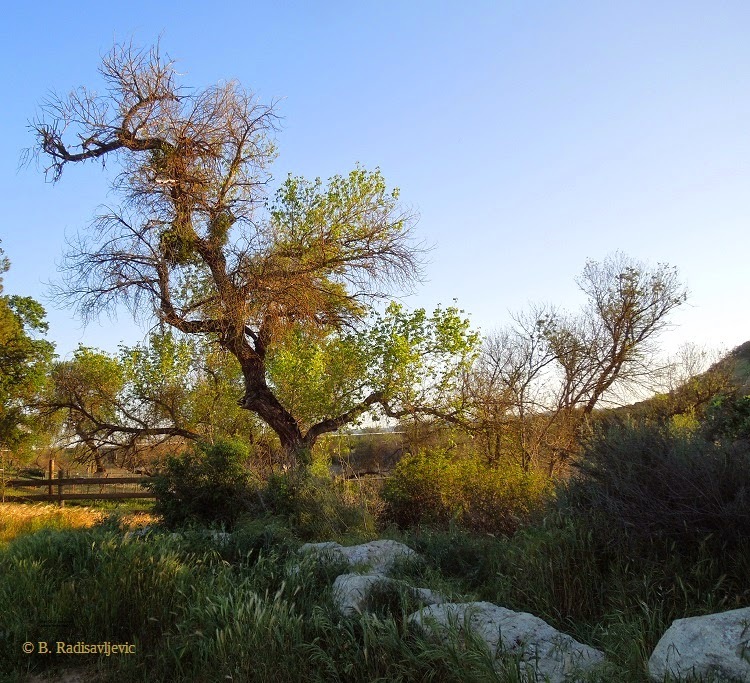 Most of my readers have figured out that I love the oak trees that live near me. 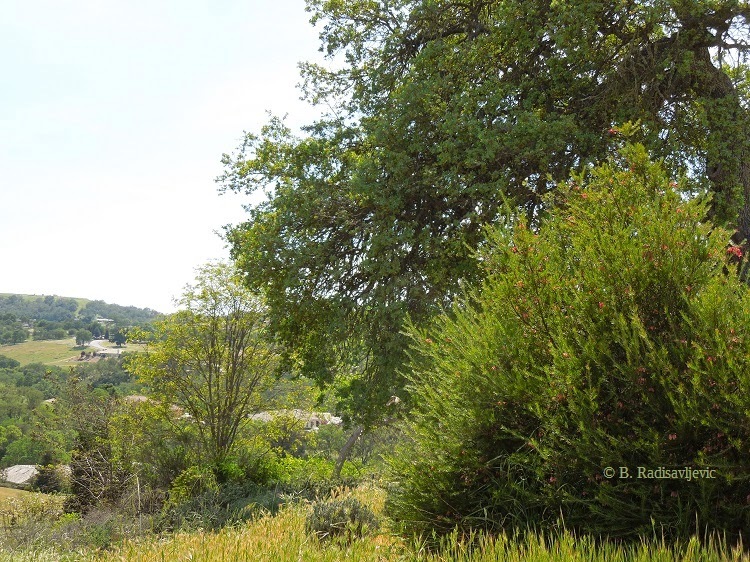 Paso Robles is named for its oaks, They were here before the almond trees or the grape vines that later brought Paso Robles to national attention. 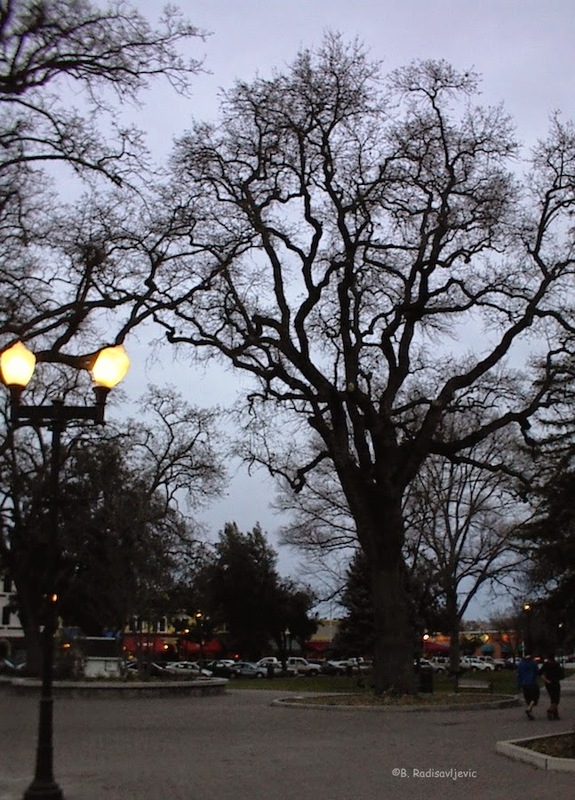 Some of the city's largest oaks are downtown, and some dwell in the City Park. That is where this one lives. It is next to the old Carnegie Library, now the Historical Museum. This photo was taken around February a few years ago as it was beginning to get dark. 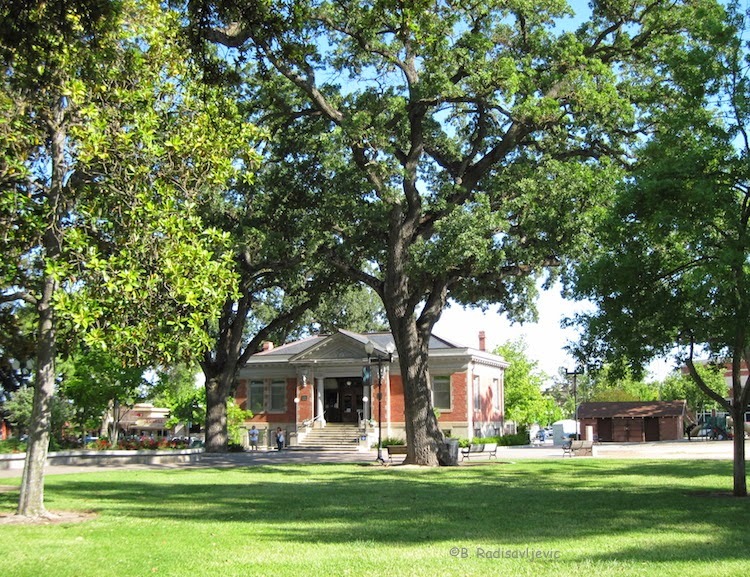 To see a view of more of the park's trees and the old library building itself, which has become a landmark to all who love Paso Robles, I show you this photo. The tree above is just one of the large oaks in the City Park. This photo shows you more of them, as well as some of the other trees. The photo was taken in June, 2011, before the restrooms you see in the background were replaced. The Old Carnegie Library building is not small, but you can see how the trees dwarf it. Does your city have one of the original Carnegie libraries? Does it have large oak trees? 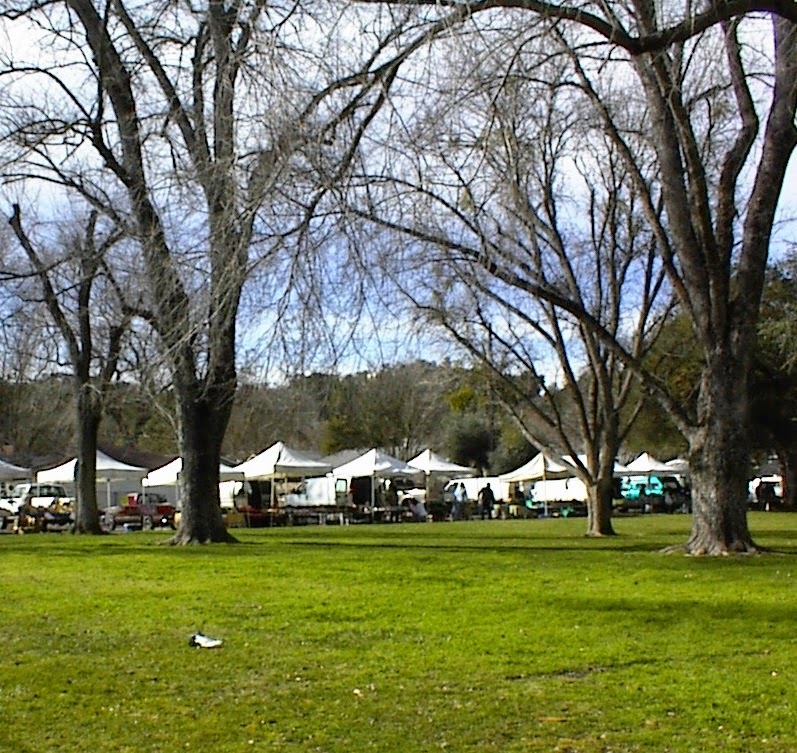 One of the things I love most about living in Templeton is its Saturday farmers market. I got a late start today, so the strawberries I'd wanted were sold out, but I did get some lettuce, tomatoes, and broccoli. I also took a look at the craft and plant vendor tables. One booth I can never pass without stopping to look is Serena’s Grown from the Heart. 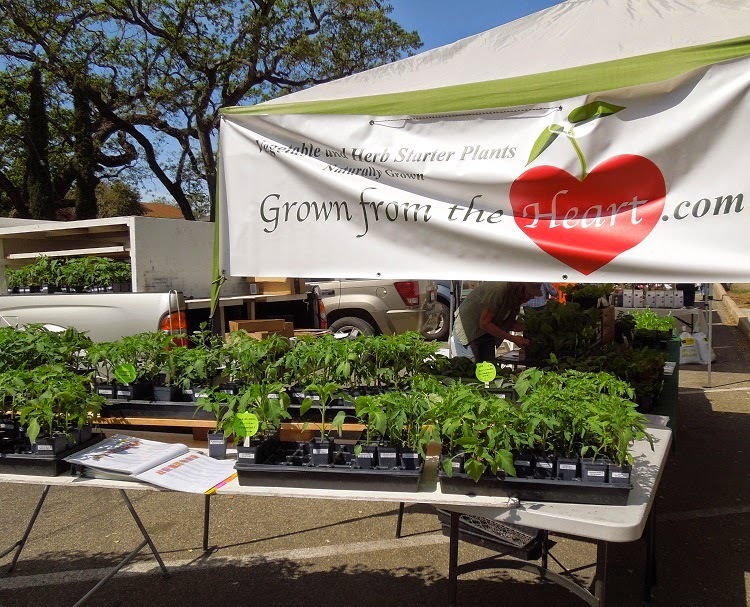 I normally buy my herbs and vegetable plants from her booth when I have a place to grow them. I did buy several herbs from her today, but I have no idea yet where I will plant them. I also bought some lettuce and another chard plant. I like Serena's plants because she grows them from organic seeds. I've been buying from her for years. Right next door to Serena was Ralph Johnson. He was selling tomato and pepper plants, also organic, but I'm afraid to put them in the ground yet. One year I was sure it was warm enough, I planted when the weather was in the nineties in April, and we got a freeze the next weekend. Here's what I did to try to revive my near-dead tomato plants that year. Anyway, I decided to pass on buying tomato or pepper seedlings from anyone this early. Ralph did have something I wanted though. He sells organically grown seeds, and I bought a pack for growing quinoa. The nice thing about buying from the people who actually grow your plants is that they can give you lots of advice on planting and raising them. Although I rarely need or buy craft items, I love looking at them and would know where to go if I ever needed a special gift for someone. Today I was intrigued by Barbara Hope's handcrafted soaps and other handmade gift items. I suggest you click on this photo (or any other here) to enlarge it for a closer look at all the goodies on Barbara's table. 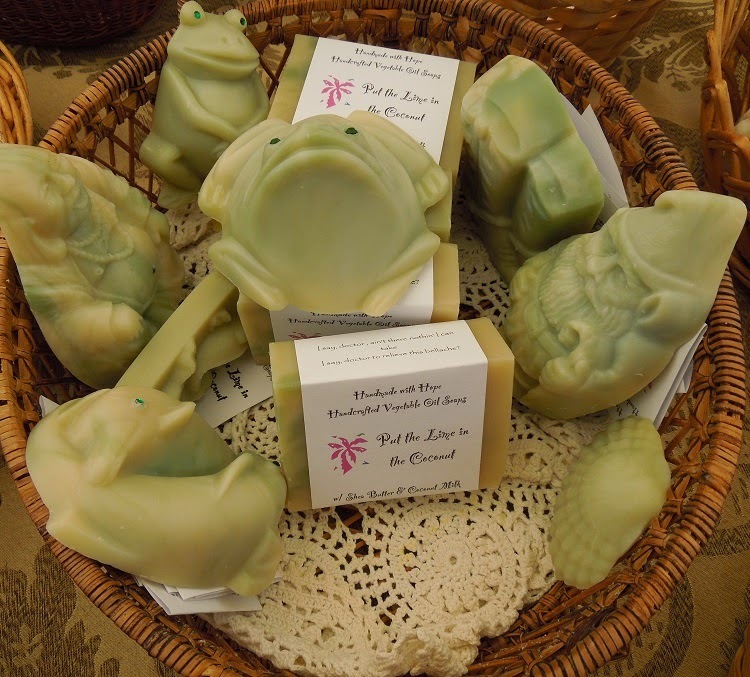 Since you can't really get a good look at Barbara's soaps in the photo above, I'm going to show you a close-up one of them I especially liked -- the frog soaps. Barbara also sells handmade greeting cards, essential oils, and other gift items. Although she doesn't have a web site yet, she will ship anywhere. 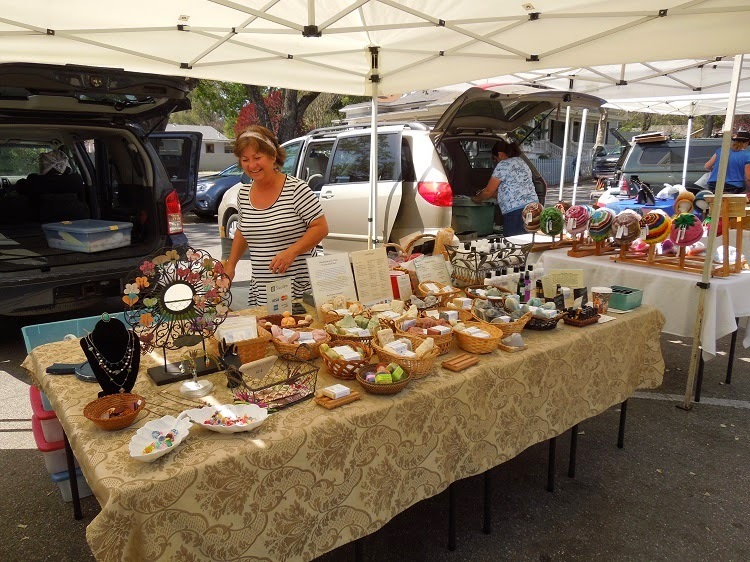 She sells locally at various farmers markets in Baywood, Pismo Coast Plaza, Templeton, and Morro Bay. This is only a bit of what I saw on display today besides the produce. Probably half our market at this time of year consists of craft items and ready-to-eat foods. I will show you some of those products on another day. When you see too much at once, you can't focus on anything very well. 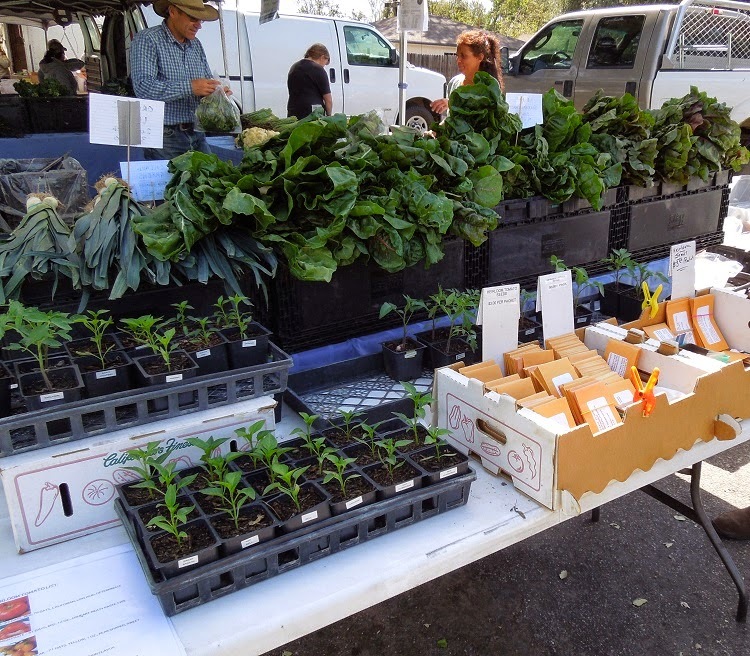 Do you go to a farmers market in your town? If so, does it have more than produce? Plant These 4 Spring Vegetables ASAP for a Harvest in Less Than a Month! Yes, You CAN Grow Plants!